Find help with anything from paper writing to job searching! Have a question? Just send it to the friendly Sullivan University librarians! ACM (Association for Computing Machinery) Digital Library Description of this database. Learning Express Library Description of this database. Lippincott Williams & Wilkins (LWW) Nursing & Health Professions Premier Collection Description of this database. This database subscription has been cancelled. If you need a specific article that is not available in full-text please submit an Interlibrary Loan Request. 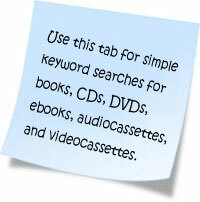 As the sticky note implies, this search box is for basic keyword searching. However, the new catalog allows for some powerful sorting/limiting so pay attention to the left hand side of the screen once the results load. Among the twelve options, you can for example limit by location (Sullivan Louisville for example) by format (DVD for example) and by publication date.